Robert Metz – Rhonda London LIVE: Should Welfare Recipients Be Drug Tested? 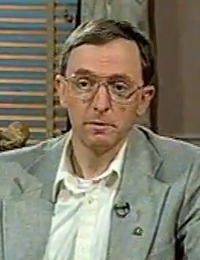 On August 1, 2000, Robert Metz (President, Freedom Party of Ontario) was a guest of Rhonda London Live. In this episode, Metz discussed with host Rhonda London an Ontario Progressive Conservative proposal for mandatory drug testing for welfare recipients. Also guests on this episode: Joe Cordiano (Liberal Party of Ontario critic for Community and Social Services) and Andrea Calver (Ontario Coalition for Social Justice). Featuring: Robert Metz (President, Freedom Party of Ontario), Joe Cordiano (Liberal Party of Ontario critic for Community and Social Services) and Andrea Calver (Ontario Coalition for Social Justice). Paul McKeever – Michael Coren Live! : Higher Sentences for Crimes Motivated by Hate Paul McKeever – Rhonda London LIVE: 60-hour Work Week – Is it too much?